My Lords, it is with great sadness that I convey from these Benches the support of the Lords Spiritual for the Motion. I hope, too, that my few words may reflect some of the feelings of the wider Church. As we reflect on and pay tribute to a life well lived, our hearts go out to all those who will miss her most; the Queen and the Royal Family. As has already been mentioned, their bereavement is the greatest and the hardest to bear. Yet so greatly has the Queen Mother been loved that we all recognise a sense of real loss. That great love and the respect she has inspired across the generations arose from her marvellous example of service and duty. Yet to this she has added her own very special grace and charm, so that every family, here in Britain and across the Commonwealth, found a place for her in their hearts. We appreciated the way she took up uncomplaining the unexpected burden of service to her country and we remember a Queen Mother who carried this burden with unfailing courage, supported by the great joy that she took in her family. Let us not forget that she faced with courage, as has already been mentioned, the private sadness of the loss of her husband, a widowhood of 51 years, and very recently the death of her younger daughter. One source of this courage was her deep and straightforward faith in Almighty God. Her devotion to the truths of the Christian gospel was a rich source of strength. It helped to sustain her throughout her long life, lived with such grace, elegance and, most of all, with a deep and enduring joy. I want to add to the anecdotes that have already been mentioned. I remember her saying with a laugh that I was her eighth archbishop. She had known Randall Davidson, who was appointed Dean at Windsor by Queen Victoria. 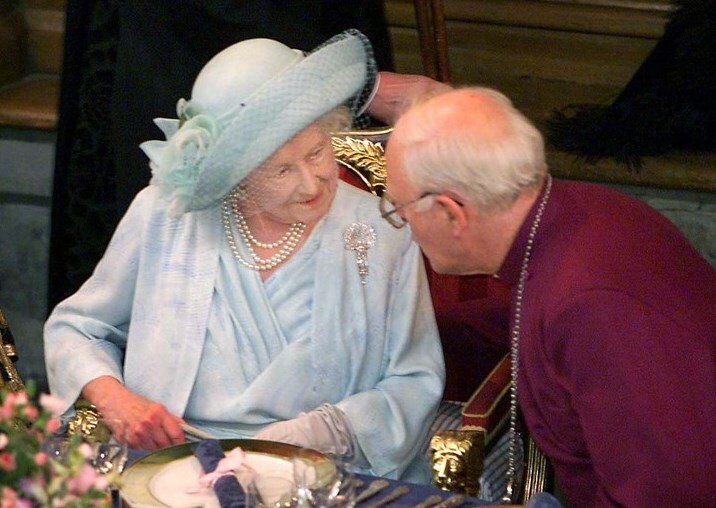 I may have been one of eight archbishops but the Queen Mother was unique. On another occasion I recall mentioning the name of John Henry Newman, who was vicar of St Mary’s, Oxford as long ago as the 1820s. Her reply stunned me. “Oh yes,”, she replied with enthusiasm, “my grandfather was profoundly influenced by him”. Suddenly we had travelled back the best part of 180 years. We cannot do better than to pause today, as we are doing, to say a heartfelt thank you for a long life, one nurtured by a direct and deep faith in Almighty God, a faith expressed in those wonderful words of St Paul: whatsoever things are true, whatsoever things are honest, whatsoever things are just, whatsoever things are pure, whatsoever things are lovely, whatsoever things are of good report; if there be any virtue, and if there be any praise, think on these things”. We think on them, too, and we thank God for all she has meant to us and all she has given to us. In this Easter season, we thank Him too that she has passed into that fullness of life which Easter promises through the Resurrection of Jesus Christ from the dead.